Heya everyone, it's the weekend!!!!! Hope you've all had a good week! Today I thought I would talk to you about some of my favorite scents for the Christmas Period. Now you all know how much I love yankee candles. My plan was to do this post after I bought some of their newer scents for the holiday season, but with Christmas just around the corner, all of my money is going on my friends and family so I don't want to seem extremely selfish wasting my money on something I could just purchase after! However, I do have some Christmas scents in my collection which I will share for you all today. This is probably my favorite candle of the lot. It just smells so gorgeous. Think freshly baked treats on a cold winters afternoon. I love the hints of vanilla and the scent of freshly baked cookies and even just talking about it is making my mouth water. It smells absolutely incredible. As you can see from the photograph about I have used it quite a lot and it's running out which is making me very sad indeed, but I'm hoping to place an order for this candle next week. Now I have had this candle in my collection for quiet a long time now but I haven't actually used it. I was quite uncertain about the smell when I first got it but I've been leaving it around my room with the lid off and I actually quite like the scent. It smells like apples and vanilla with a sprinkle of sugar. It's not exactly a really sweet scent which is probably why I didn't warm to it at first but I find out of all the Christmas scents this one has a more natural scent to it. Definitely a candle I need to start burning. Another one of my favorite Christmas scents. This candle smells delicious and brings back a lot of memories of Christmas when I was younger. It's a very light but crisp scent and has a very sweet but light undertone to it. It smells like fresh snow with a hint of cherry. Absolutely gorgeous and one I would highly recommend. Probably my second favorite candle in my collection right now. As I've already mentioned I absolutely love sweet scents. I am a huge lover of red velvet cake, so when I spotted this on the website I did not hesitate to purchase it. When I light this the room smells as if I have just made a fresh red velvet cake. It fills the whole room with fragrance and is just an absolutely gorgeous scent. Paired with the Christmas Cookie candle you can imagine how wonderful the smell is! 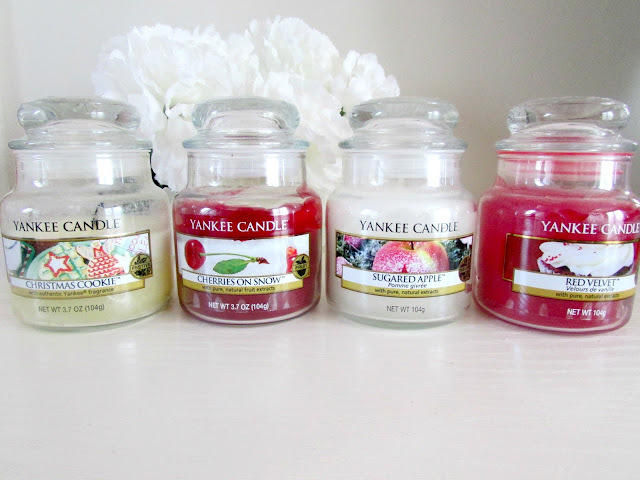 Yankee Candles are for me the best candles out there, the whole candle burns really well and doesn't leave any residue on the sides which you can get with a lot of candles and for a small candle you do get a lot of use out of them. I always opt for the smallest jars as I find they are the perfect size. Not so big that you get sick of them but not to small that you use it all up. Head on over to the Yankee Candle website now to purchase your favorite scents for only £8.39 each. 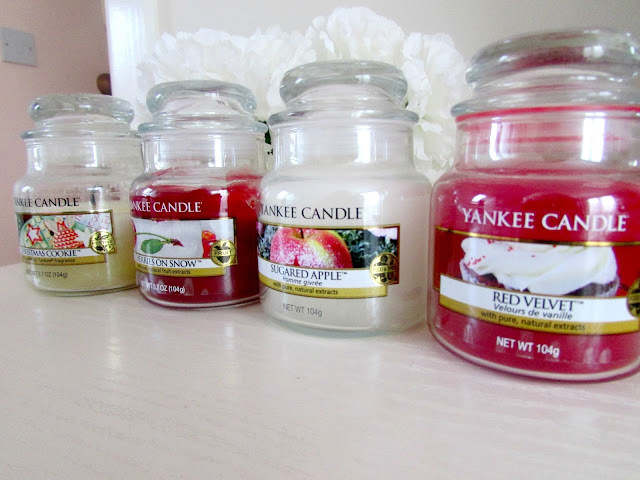 Are you a fan of Yankee Candles? What are your favorite scents? I have Christmas Cookie and Red Velvet. I bought Salted Caramel recently too, that smells amazing. I'm giving away a Christmas Cookie on my blog at the minute if you want to take a look! I have a friend that gets me these and I love Christmas eve, I have so many I burn them all day!